My 15 year old took a surfing lesson with Ryan’s staff for the first time! The staff was beyond amazing: very professional and knowledgeable. They are in an excellent location and prices were very reasonable for their level of expertise! The water was only 55 degrees when we were there, Ryan has wet suits available that made my son very comfortable! We plan to make this an annual experience for our family that resides in Minnesota! Thanks for the great memory! February 2019 My 15 year old took a surfing lesson with Ryan’s staff for the first time! The staff was beyond amazing: very professional and knowledgeable. They are in an excellent location and prices were very reasonable for their level of expertise! The water was only 55 degrees when we were there, Ryan has wet suits available that made my son very comfortable! We plan to make this an annual experience for our family that resides in Minnesota! Thanks for the great memory! Highly Recommend! I called to schedule a lesson for a birthday gift and received the best service. I received a call back within a day and Ryan was so wonderful. He went above and beyond my expectations in so many ways. First, he made sure that the conditions would be good and was very flexible with us on the time so the experience could be great considering it was winter and rain in the forecast. He then made sure there would be appropriate boards and wetsuits ready for new learners. When we arrived, he had a parking space saved for us and a photographer as well. During the lesson, he was so fun and encouraging and his technique was effective as all of the surfers got up on the board within the hour. All surfers wanted to go back again! Thanks Ryan for a great day and experience. February 2019 Highly Recommend! I called to schedule a lesson for a birthday gift and received the best service. I received a call back within a day and Ryan was so wonderful. He went above and beyond my expectations in so many ways. First, he made sure that the conditions would be good and was very flexible with us on the time so the experience could be great considering it was winter and rain in the forecast. He then made sure there would be appropriate boards and wetsuits ready for new learners. When we arrived, he had a parking space saved for us and a photographer as well. During the lesson, he was so fun and encouraging and his technique was effective as all of the surfers got up on the board within the hour. All surfers wanted to go back again! Thanks Ryan for a great day and experience. I had an amazing experience learning to surf! Ryan was an awesome instructor. He was super encouraging and really knows what he’s doing. February 2019 I had an amazing experience learning to surf! Ryan was an awesome instructor. He was super encouraging and really knows what he’s doing. The owner of the shop, Ryan, is an enthusiastic and encouraging instructor who definitely goes the extra mile to help beginner surfers learn! He has the heart of a teacher and is very accommodating. I feel confident in the surfing technique he taught me and my friends, and I’m ready to hit the waves on my own! February 2019 The owner of the shop, Ryan, is an enthusiastic and encouraging instructor who definitely goes the extra mile to help beginner surfers learn! He has the heart of a teacher and is very accommodating. I feel confident in the surfing technique he taught me and my friends, and I’m ready to hit the waves on my own! Absolutely amazing teaching. He was very kind and patient with my friends and I. He took time to teach us both the basics and in-water skills. Our instructor spent time to talk us through every little thing we needed to know while being enthusiastic and encouraging to us. I would recommend highly to any person interested in surfing or wanting to try something new. January 2019 Absolutely amazing teaching. He was very kind and patient with my friends and I. He took time to teach us both the basics and in-water skills. Our instructor spent time to talk us through every little thing we needed to know while being enthusiastic and encouraging to us. I would recommend highly to any person interested in surfing or wanting to try something new. I've been wanting to take a surf lesson for years and my wife and I finally took the plunge. We are glad we did and SO glad we picked Vast Oceans! Pro surfer/owner Ryan and the staff here are absolutely top notch, you can tell they have a true love for the sport and are amazing, patient teachers. Prices were very fair for these guys' extensive knowledge and the excellent student experience they provide. They will take care of you and go the extra mile to make sure you have a great time. We felt really safe with our instructor Aaron in the waves with us because he grew up surfing these breaks, and is a lifeguard too. Aaron had tons of great insights on body positioning on the board to catch waves, waxing your board, reading the waves, spotting rips, etc. We ended up catching a bunch of waves and can't wait to come back to Vast Oceans for more! January 2019 I've been wanting to take a surf lesson for years and my wife and I finally took the plunge. We are glad we did and SO glad we picked Vast Oceans! Pro surfer/owner Ryan and the staff here are absolutely top notch, you can tell they have a true love for the sport and are amazing, patient teachers. Prices were very fair for these guys' extensive knowledge and the excellent student experience they provide. They will take care of you and go the extra mile to make sure you have a great time. We felt really safe with our instructor Aaron in the waves with us because he grew up surfing these breaks, and is a lifeguard too. Aaron had tons of great insights on body positioning on the board to catch waves, waxing your board, reading the waves, spotting rips, etc. We ended up catching a bunch of waves and can't wait to come back to Vast Oceans for more! Had a great time learning to surf with Vast Oceans. Ryan the owner was really sweet to open up his shop for us in the off season (actually during December holiday season!). We had a good lesson on the basics and we caught a couple waves! January 2019 Had a great time learning to surf with Vast Oceans. Ryan the owner was really sweet to open up his shop for us in the off season (actually during December holiday season!). We had a good lesson on the basics and we caught a couple waves! Ryan Ragan is an incredible instructor. I tried surfing a number of times previously with limited success. After an hour lesson, Ryan got me up on almost every wave. He is able to break down the concepts, and instill a sense of confidence. Worth every penny. Highly recommend. November 2018 Ryan Ragan is an incredible instructor. I tried surfing a number of times previously with limited success. After an hour lesson, Ryan got me up on almost every wave. He is able to break down the concepts, and instill a sense of confidence. Worth every penny. Highly recommend. Had a great time (first surfing experience) fun and personable guy also. Check it out if you get the chance. November 2018 Had a great time (first surfing experience) fun and personable guy also. Check it out if you get the chance. It was so fun, and a telly good teacher. November 2018 It was so fun, and a telly good teacher. Ryan is a great guy. Full of knowledge and experience. The surf was small but he made sure I had a great time. I caught 20 waves and had tons of fun !!! November 2018 Ryan is a great guy. Full of knowledge and experience. The surf was small but he made sure I had a great time. I caught 20 waves and had tons of fun !!! Ryan was a great coach. Had my first surf lesson in Daytona beach - Ryan made sure we got the most experience out of it. Will be happy to go surfing again soon ! November 2018 Ryan was a great coach. Had my first surf lesson in Daytona beach - Ryan made sure we got the most experience out of it. Will be happy to go surfing again soon ! Ryan gave our son a private surfing lesson for his 17th birthday. Our son had never been in the ocean before, but Ryan was patient, and our son was surfing by the end of the lesson. Thanks Ryan for an unforgettable experience for our entire family! October 2018 Ryan gave our son a private surfing lesson for his 17th birthday. Our son had never been in the ocean before, but Ryan was patient, and our son was surfing by the end of the lesson. Thanks Ryan for an unforgettable experience for our entire family! The owner Ryan was awesome. Super friendly and a fun teacher to learn from. Loved the way he talked us through each step before releasing us to the ocean. It really was a blast!!! Would definitely recommend him if interested in surf lessons or rentals. October 2018 The owner Ryan was awesome. Super friendly and a fun teacher to learn from. Loved the way he talked us through each step before releasing us to the ocean. It really was a blast!!! Would definitely recommend him if interested in surf lessons or rentals. Surprised our boys with surf lessons and it didn't disappoint!! Ryan started us off with great instruction then talked us through the actual surfing. Many waves were way too big for me and our younger son so he grabbed the board for us to keep us from getting beat up. Took me and our youngest about 5 rides to get up and stay up but after that we were golden! My husband and our older boy were up on the first ride! Most fun we've ever had in the water and worth every penny! Highly recommend Ryan!! October 2018 Surprised our boys with surf lessons and it didn't disappoint!! Ryan started us off with great instruction then talked us through the actual surfing. Many waves were way too big for me and our younger son so he grabbed the board for us to keep us from getting beat up. Took me and our youngest about 5 rides to get up and stay up but after that we were golden! My husband and our older boy were up on the first ride! Most fun we've ever had in the water and worth every penny! Highly recommend Ryan!! Ryan's the best. Great instructor, excelent with the kids. September 2018 Ryan's the best. Great instructor, excelent with the kids. Had a wonderful experience with a one-on-one session for stand up paddle boarding. Ryan is awesome. He is very enthusiastic about the sport. He had me standing up on the paddle board within 10 minutes, amongst the 2-3foot seas. The first part of the lesson was on the sand showing me proper posture and movements of the paddle. He guided me into the water and was with me every step of the way and gave me support and confidence to enable me to finally stand up. Ryan has a true passion for surfing and teaching. He is certainly qualified with the experience of surfing and competing around the world through the years. Lessons are conducted by him personally. I would definitely recommend him for all your surfing needs. September 2018 Ryan has a true passion for surfing and teaching. He is certainly qualified with the experience of surfing and competing around the world through the years. Lessons are conducted by him personally. I would definitely recommend him for all your surfing needs. Wanted to thank Ryan and his team at Vast Oceans yesterday for such an AWESOME time. We have been to several Surf Schools in California and Hawaii , this was by far our best experience. Ryan had a tent waiting for US to keep my family out of the very hot sun and from start to finish very accommodating. I called to get a quote and compare Ryan's services to others offering the same in the area. My phone conversation with him left me feeling like he was being pushy and boisterous. Later I found him blowing up my phone, texting me numerous times and being very unprofessional. After more then 17 missed calls from him in 2 days I decided to post this. I didn't even call him back or answer his call, go to a class and after looking through his almost 5 star reviews, luckily I found one person who was honest on his review about his experience with Ryan's unprofessionalism and bully mentality. Update: Right after I posted this he found me on Facebook harassing me once again and threatening me If I didn't take this review down. Now I know why it has very few negative reviews because he probably does the same thing to people that he did to me and they take their reviews down. I have been in the surf buisness for many years and have surfed for 46 years in Florida. It's awesome to see teachers/pro surfers like Ryan not only have a passion to help begginers learn the sport correctly,and safely,but also his professional talent and knowledge goes far more then most I have worked with or have seen in Florida. This is not a profession or a business that you're making a ton of money,it's more about the heart and the passion for others and loving the sport of surfing. Ryan is that kind of coach in and out of the water. Let's put aside his athletic ability and talent in the water,because he also understands it's what you do in the community and out of the water that counts as well. I highly recommend Vast Ocean School and knowing that you have somebody who's travel the world, and surfed many places, there's no one better than Ryan. August 2018 I have been in the surf buisness for many years and have surfed for 46 years in Florida. It's awesome to see teachers/pro surfers like Ryan not only have a passion to help begginers learn the sport correctly,and safely,but also his professional talent and knowledge goes far more then most I have worked with or have seen in Florida. This is not a profession or a business that you're making a ton of money,it's more about the heart and the passion for others and loving the sport of surfing. Ryan is that kind of coach in and out of the water. Let's put aside his athletic ability and talent in the water,because he also understands it's what you do in the community and out of the water that counts as well. I highly recommend Vast Ocean School and knowing that you have somebody who's travel the world, and surfed many places, there's no one better than Ryan. Big thank you Ryan at Vast Oceans Surf School, this was our 3rd summer bringing our family to surf classes and WOW was it fun. If your looking for surf camps or lessons go no further Ryan is the best. His school is very fun and safe. Ryan is such an amazing teacher and we really trust him with our girls 9 and 11. Definitely Highly recommend Vast Oceans. August 2018 Big thank you Ryan at Vast Oceans Surf School, this was our 3rd summer bringing our family to surf classes and WOW was it fun. If your looking for surf camps or lessons go no further Ryan is the best. His school is very fun and safe. Ryan is such an amazing teacher and we really trust him with our girls 9 and 11. Definitely Highly recommend Vast Oceans. Had a SUP lesson for two this past weekend. Ryan is very passionate about what he does and provided great instruction! We'll likely return soon for another rental. Ryan is a pro (literally) and helped me check off one of my major bucket list items. Working with his one-on-one instruction had me up and riding ...standing on several swells...something unheard of in first-time surfing instruction. Don’t settle, go with a multi-time champion. Best in Daytona. August 2018 Ryan is a pro (literally) and helped me check off one of my major bucket list items. Working with his one-on-one instruction had me up and riding ...standing on several swells...something unheard of in first-time surfing instruction. Don’t settle, go with a multi-time champion. Best in Daytona. Ryan is a good surf instructor. His surf shop is relaxed. All the employees are really sweet. Thanks for the lesson and for making my birthday super fun! August 2018 Ryan is a good surf instructor. His surf shop is relaxed. All the employees are really sweet. Thanks for the lesson and for making my birthday super fun! If I could rate Ryan and his top knotch crew a 10, I would! After my first lesson with ryan I purchased 6 more, he is AMAZING! I also purchased a board from him which he hand picked for me to meet my surfing needs. He is an amazing instructior and wants to ensure you have a great time. I look forward to many more surf lessons from Ryan. He is so easy to get ahold of to schedule lessons and always willing to lend a helping hand to ensure you have the best experience ever. If you want to learn how to surf, Ryan is your guy. He had me up on my fist wave! August 2018 If I could rate Ryan and his top knotch crew a 10, I would! After my first lesson with ryan I purchased 6 more, he is AMAZING! I also purchased a board from him which he hand picked for me to meet my surfing needs. He is an amazing instructior and wants to ensure you have a great time. I look forward to many more surf lessons from Ryan. He is so easy to get ahold of to schedule lessons and always willing to lend a helping hand to ensure you have the best experience ever. If you want to learn how to surf, Ryan is your guy. He had me up on my fist wave! We brought our kids to Vast Oceans Surf Camp/ School for a week straight and we can not speak highly enough about our experience. The kid's have not stopped talking about Ryan and surfing with A PRO. Ryan was so helpful and accommodating each day throughout the week. We thought he had his hands full with our group, but he and his instructor Jimmy were terrific. Definitely the highlight of our summer and we are making this an annual trip. Great waves and fun had by all of US. Ryan was a good instructor but everything else was horrible! He is filled with anger at the world, rightfully so, but he does not keep that consealed in front of his clients. I overheard him yelling at a customer on the phone and I had to listen to hours of rants instead of focusing on surfing. He acted like he gave me a good deal when I got 3 "days" of lessons for $290 (I believe). But they were only like an hour long session each day! On the way to Daytona from Orlando I ran into some bad weather. I called Ryan to see if the lesson was still on for the day. He yelled at me and then proceeded to tell me that if I did not show up for the lesson I would not get a refund! I showed up to the lesson and was only able to surf for 30 min. He said that it didn't matter because we had "extra time" they day before, however, most of that extra time was me counseling him about his ex. He should have been paying me! The last day of the surfing lesson he jumped on top of me when a big wave came which I found extremely awkward and un professional. I would have rather gotten hurt from the wave then have a 45 year old man jump on top of me! He apparently did something to his knee and cut the lesson short. I was just then learning how to surf well. And I asked if I could have the board for the rest of the day which he said I could do in the past. He refused because of the rough weather conditions. So I only got one full lesson of surfing out of the three days! and asked if she could use the rest of my friend's lesson and he said no then later told me my friend was too out of shape and fat to be able to surf. He is so obnoxious about tipping and will litterally beg for a 20% tip stating that's the only way he makes a living... Maybe he should charge more for the lessons and not expect the tip! So I only had $10 so I said I would too him the next day. The next day I wasn't going to tip him because I had a horrible experience and he said remember how yesterday you said you were going to take care of me? And forced me to tip him. I just had to share because he tried to make me post a 5 star review and people need to know the truth! Had a great time! Ryan is a great teacher and I highly recommend him! August 2018 Had a great time! Ryan is a great teacher and I highly recommend him! Ryan and his staff were amazing! We had a great time and plan to take lessons on a weekly basis. He is amazing! July 2018 Ryan and his staff were amazing! We had a great time and plan to take lessons on a weekly basis. He is amazing! Amazing at teaching how to surf. My friends were able to stand up and surf first day!! Jimmy did a great job on the water guiding them to great waves. July 2018 Amazing at teaching how to surf. My friends were able to stand up and surf first day!! Jimmy did a great job on the water guiding them to great waves. It’s was super fun! And it was very one on one! July 2018 It’s was super fun! And it was very one on one! Why is Ryan Ragan *RAD*? Ryan had me standing up on my board inside of an hour! I tried a couple of other surfing schools in the Daytona Beach area, and did not feel as confident in my skills as I felt with Ryan. You can tell that surfing is his passion, and it is evident in his teaching style. I wholeheartedly endorse Ryan as a teacher and surfing professional. He is super patient, and inspires and empowers his students to perform beyond their expectations. Run, do not walk to his school and sign up *now*. July 2018 Why is Ryan Ragan *RAD*? Ryan had me standing up on my board inside of an hour! I tried a couple of other surfing schools in the Daytona Beach area, and did not feel as confident in my skills as I felt with Ryan. You can tell that surfing is his passion, and it is evident in his teaching style. I wholeheartedly endorse Ryan as a teacher and surfing professional. He is super patient, and inspires and empowers his students to perform beyond their expectations. Run, do not walk to his school and sign up *now*. Learning to surf never really crossed my mind until my dad mentioned it and I wanted to do it.Ryan Ragan will believe in you and you’ll do good.He taught us really well and I learned to surf in three days.i could stand and actually surf, So I highly recommend him if you want to learn to surf amazing.you will get taught really good. P.s:I’d give him 6 stars possibly more if I could. July 2018 Learning to surf never really crossed my mind until my dad mentioned it and I wanted to do it.Ryan Ragan will believe in you and you’ll do good.He taught us really well and I learned to surf in three days.i could stand and actually surf, So I highly recommend him if you want to learn to surf amazing.you will get taught really good. P.s:I’d give him 6 stars possibly more if I could. It was always a dream of mine to surf and Ryan Ragan helped me accomplish that. I stood up on the FIRST DAY!!! He is so nice and teaches very well. I hope to have another session soon and i wouldve rated him a 6th star if i could!! July 2018 It was always a dream of mine to surf and Ryan Ragan helped me accomplish that. I stood up on the FIRST DAY!!! He is so nice and teaches very well. I hope to have another session soon and i wouldve rated him a 6th star if i could!! his is the best place to take surf lessons. Ryan Ragan is the best instructor ever. He is so patient when he taught my 11 year old son how to surf. He also is a great man. My son cant wait to go back and see him and take some more lessons. July 2018 his is the best place to take surf lessons. Ryan Ragan is the best instructor ever. He is so patient when he taught my 11 year old son how to surf. He also is a great man. My son cant wait to go back and see him and take some more lessons. Best Experience Ever! Signed my son up for surf lessons with Ryan. Having a professional surfer as an instructor was incredible. Ryan is confident, fun and knowledgeable. Had a lesson on safety and technique before hitting the water. Brought out several boards on the second lesson so my son could see what worked best for him. Even brought out a tent for our family. Ryan made it a great experience for all involved and it was amazing to see our son out there surfing like a pro just after two lessons! July 2018 Best Experience Ever! Signed my son up for surf lessons with Ryan. Having a professional surfer as an instructor was incredible. Ryan is confident, fun and knowledgeable. Had a lesson on safety and technique before hitting the water. Brought out several boards on the second lesson so my son could see what worked best for him. Even brought out a tent for our family. Ryan made it a great experience for all involved and it was amazing to see our son out there surfing like a pro just after two lessons! Ryan was a great instructor. Got us to a point to where we couldn't have gotten to by ourselves if he wouldn't have worked with us. June 2018 Ryan was a great instructor. Got us to a point to where we couldn't have gotten to by ourselves if he wouldn't have worked with us. Ryan was very confident in his ability to get my husband started surfing. We appreciated that he let him use the surf board after the lesson for a while. I messed up one of his surf boards by leaving it in the sun, and he was very patient and kind with me. I would recommend Ryan to anyone I knew traveling to Daytona Beach. June 2018 Ryan was very confident in his ability to get my husband started surfing. We appreciated that he let him use the surf board after the lesson for a while. I messed up one of his surf boards by leaving it in the sun, and he was very patient and kind with me. I would recommend Ryan to anyone I knew traveling to Daytona Beach. I've been taking lessons with with Ryan for a couple years now, and I have an awesome time every single time. He's always patient and encouraging makes sure I have a safe and awesome time on the waves. Whether the conditions are glassy or choppy, Ryan is the guy to go to for surf lessons. I love surfing!! June 2018 I've been taking lessons with with Ryan for a couple years now, and I have an awesome time every single time. He's always patient and encouraging makes sure I have a safe and awesome time on the waves. Whether the conditions are glassy or choppy, Ryan is the guy to go to for surf lessons. I love surfing!! Had an amazing time renting bikes from Ryan. Great service and very considerate. Will definitely be back for surf lessons! May 2018 Had an amazing time renting bikes from Ryan. Great service and very considerate. Will definitely be back for surf lessons! Always dreamed of surfing and Ryan made it happen. Great staff learned the basics of surf and he got me on my first wave. Everyone should learn here. May 2018 Always dreamed of surfing and Ryan made it happen. Great staff learned the basics of surf and he got me on my first wave. Everyone should learn here. Ryan is the best instructor you will find in Daytona beach , probably the best one south. Ryan is very passionate about teaching and surfing. Right off the bat you can tell that he does it out of love and not just for the money. Very knowledgeable .. he will teach you style , technics , and most important how be safe out there..
May 2018 Ryan is the best instructor you will find in Daytona beach , probably the best one south. Ryan is very passionate about teaching and surfing. Right off the bat you can tell that he does it out of love and not just for the money. Very knowledgeable .. he will teach you style , technics , and most important how be safe out there..
Ryan was a wonderful instructor! Really patient, and so excited to see you succeed! You can tell he has a lot of experience teaching and makes it easy! I was able to get up and ride a wave within an hour!! April 2018 Ryan was a wonderful instructor! Really patient, and so excited to see you succeed! You can tell he has a lot of experience teaching and makes it easy! I was able to get up and ride a wave within an hour!! This was the COOLEST thing ever!!! All my life I have wanted to learn to surf, and when we found Vast, my dreams came true. The lesson started off with safety and dry land techniques, then we moved on to the water as soon as we were ready. In the beginning I was sort of doing okay, for I was popping up ‘goofy foot.’ Towards the end of the lesson I realized that that wasn’t working and I was actually ‘regular foot.’ Luckily, I realized this was the problem before the lesson ended, and Ryan did everything he could to make the rest of it worth it (I caught a few AWESOME waves after I switched; we also switched to longer boards as well which were easier to get up on) After our lesson was over, he allowed my brother and I to try and catch some waves by ourselves, only in about waist deep water though. Overall, I would rate this experience a 10, and would definitely recommend going to Vast if you want to learn to surf!!! April 2018 This was the COOLEST thing ever!!! All my life I have wanted to learn to surf, and when we found Vast, my dreams came true. The lesson started off with safety and dry land techniques, then we moved on to the water as soon as we were ready. In the beginning I was sort of doing okay, for I was popping up ‘goofy foot.’ Towards the end of the lesson I realized that that wasn’t working and I was actually ‘regular foot.’ Luckily, I realized this was the problem before the lesson ended, and Ryan did everything he could to make the rest of it worth it (I caught a few AWESOME waves after I switched; we also switched to longer boards as well which were easier to get up on) After our lesson was over, he allowed my brother and I to try and catch some waves by ourselves, only in about waist deep water though. Overall, I would rate this experience a 10, and would definitely recommend going to Vast if you want to learn to surf!!! My son had the best time here. Ryan is very knowledgeable and amazing with kids. He was such a delight to work with. We really noticed a difference in the quality of surf lessons now that we are being taught my a pro surfer!! Will definitely keep coming back! April 2018 My son had the best time here. Ryan is very knowledgeable and amazing with kids. He was such a delight to work with. We really noticed a difference in the quality of surf lessons now that we are being taught my a pro surfer!! Will definitely keep coming back! We had a great experience and our guys learned to surf. April 2018 We had a great experience and our guys learned to surf. It was good stuff. Would highly recommend. April 2018 It was good stuff. Would highly recommend. Awesome school! My grandaughter came a few weeks ago and wanted so badly to go surfing with ryan again. We were then in orlando and of cource she had the idea to go again. Ryan is the best, most patient, most educational, and made sure she was having fun. I very highly recommend him if you are leaning to surf or renting a board. A+++!! April 2018 Awesome school! My grandaughter came a few weeks ago and wanted so badly to go surfing with ryan again. We were then in orlando and of cource she had the idea to go again. Ryan is the best, most patient, most educational, and made sure she was having fun. I very highly recommend him if you are leaning to surf or renting a board. A+++!! I went surfing for the first time and had such a great time! Ryan was an awesome teacher and it was super fun and chill! April 2018 I went surfing for the first time and had such a great time! Ryan was an awesome teacher and it was super fun and chill! Ryan was very communicative and great to do business with, and Jimmy gave me a great lesson. If I’m ever back in Daytona I’ll give them my business again for sure. Thanks guys I had a great time surfing. My husband and I took lessons from Ryan last week for my birthday. We had an absolute blast! Ryan made sure that we both enjoyed ourselves and stayed out in the water with us longer than I would have expected. It was definitely a birthday to remember and I can't wait to give surfing another go in the future. Thanks, Ryan! March 2018 My husband and I took lessons from Ryan last week for my birthday. We had an absolute blast! Ryan made sure that we both enjoyed ourselves and stayed out in the water with us longer than I would have expected. It was definitely a birthday to remember and I can't wait to give surfing another go in the future. Thanks, Ryan! A great experience for my 14 year old daughter and me. The positive energy and enthusiasm made this a great time for both of us. We got up several times each! March 2018 A great experience for my 14 year old daughter and me. The positive energy and enthusiasm made this a great time for both of us. We got up several times each! Ryan is super friendly and is a great surf instructor. Learned a lot!!! March 2018 Ryan is super friendly and is a great surf instructor. Learned a lot!!! taught us a lot while making sure we were still having fun. I had a blast learning to surf and it was awesome being able to stand up and ride a wave! March 2018 I highly recommend Vast Oceans for surf lessons. I had a really great experience. Everyone there is very friendly and helpful. Our instructor was very mindful of our progress and taught us a lot while making sure we were still having fun. I had a blast learning to surf and it was awesome being able to stand up and ride a wave! We were only in Daytona Beach for 2 days. I called Ryan for a surf lesson for my 15 year old son. Ryan was gone for the day but he turned his car around and came back to the surf shop to accommodate us with a surf lesson. Ryan was just awesome, he made my son's dream come true!!! The lesson was top notch!!!!
" When things aren't going right, surf left "
March 2018 We were only in Daytona Beach for 2 days. I called Ryan for a surf lesson for my 15 year old son. Ryan was gone for the day but he turned his car around and came back to the surf shop to accommodate us with a surf lesson. Ryan was just awesome, he made my son's dream come true!!! The lesson was top notch!!!! Thanks again Ryan!! " When things aren't going right, surf left "
Ryan is a friendly and chill dude and is very knowledgeable when it comes to surfing. Super fun and we were standing up on the board by the end of the hour! I would highly recommend anyone learning to surf to learn from Ryan. February 2018 Ryan is a friendly and chill dude and is very knowledgeable when it comes to surfing. Super fun and we were standing up on the board by the end of the hour! I would highly recommend anyone learning to surf to learn from Ryan. The instructor, Ryan provided great lessons teaching you what to do and what not to do. Initially you're on the beach learning the basics then you'll take to the waves where you'll feel like you won't be able to stay on the board but after trying it a few times you'll be surfin them like a pro ? February 2018 The instructor, Ryan provided great lessons teaching you what to do and what not to do. Initially you're on the beach learning the basics then you'll take to the waves where you'll feel like you won't be able to stay on the board but after trying it a few times you'll be surfin them like a pro ? Surfing has been on my bucket list forever and finally after living in Florida for 2.5 years, I looked up lessons and seen Ryan had awesome reviews. When I went I was kinda scared but Ryan was very informative about safety and knew exactly how to teach me...even when I literally have zero balance and was nervous 😀 I would definitely recommend going to him, me and my girlfriend are actually looking fwd to booking with him soon. February 2018 Surfing has been on my bucket list forever and finally after living in Florida for 2.5 years, I looked up lessons and seen Ryan had awesome reviews. When I went I was kinda scared but Ryan was very informative about safety and knew exactly how to teach me...even when I literally have zero balance and was nervous 😀 I would definitely recommend going to him, me and my girlfriend are actually looking fwd to booking with him soon. Ryan was awesome - I needed to figure out what bad habit(s) I had picked up over the years and he nailed it 🙂 love a good coach who spots errors right away!! Thanks Ryan!! December 2017 Ryan was awesome - I needed to figure out what bad habit(s) I had picked up over the years and he nailed it 🙂 love a good coach who spots errors right away!! Thanks Ryan!! Ryan made my son's lifelong dream to surf come true on Saturday! He is an incredible instructor! His encouragement, passion and teaching methodology was priceless!!! Hands down a 5 star experience. December 2017 Ryan made my son's lifelong dream to surf come true on Saturday! He is an incredible instructor! His encouragement, passion and teaching methodology was priceless!!! Hands down a 5 star experience. Ryan is awesome! We have been in town for 2 days from Tennessee and Ryan has my 9 year old up and surfing. Can't wait to see how he does tomorrow. Highly recommend him. March 2017 Ryan is awesome! We have been in town for 2 days from Tennessee and Ryan has my 9 year old up and surfing. Can't wait to see how he does tomorrow. Highly recommend him. The best surfing session I'v ever had! Ryan Ragan is not only teaching, he is inspiring as well. I can't beleive that surfer with sooo much sport achievements can be so greate teacher as well. He improved my surfing technique significantly just in one session! Many thanks for Ryan and his school !!! I had my first surfing lesson there and i cant say more than it is soooo great. Ryan is so nice and just the best surfing teacher!!! March 2017 I had my first surfing lesson there and i cant say more than it is soooo great. Ryan is so nice and just the best surfing teacher!!! Absolutely amazing! I was flying into Daytona Beach on a Sunday afternoon, and on a whim, I emailed a couple shops from the airplane to see if anyone could possibly fit me in that afternoon. I was hoping I could get in that afternoon because I was going to be busy with work the rest of the week. Ryan got back with me before I landed and was happy to say he'd fit me in a couple hours after I landed. He said he's been at it all day, but wanted to fit me in (we ended up going to 6.30 or so). I had read around at some lesson reviews in the area, and I saw numerous ones that gave me the idea that I probably wouldn't even be standing up on the board that day -- but hey, I was gonna get in what I could. To my amazement, Ryan had me up on a board and riding within the hour. I was ecstatic since I wasn't even expecting to get up on the board at all. At the end of the set, he was sure to push me to get a good one in so I could end it on a smile instead of a fall. Killer lesson, had a blast and I'm hooked now. Really wish I could've made it back for more that week. Anyway -- super personable and nice guy. Thanks Ryan! I'll definitely swing in again the next time I'm through there. March 2017 Absolutely amazing! I was flying into Daytona Beach on a Sunday afternoon, and on a whim, I emailed a couple shops from the airplane to see if anyone could possibly fit me in that afternoon. I was hoping I could get in that afternoon because I was going to be busy with work the rest of the week. Ryan got back with me before I landed and was happy to say he'd fit me in a couple hours after I landed. He said he's been at it all day, but wanted to fit me in (we ended up going to 6.30 or so). I had read around at some lesson reviews in the area, and I saw numerous ones that gave me the idea that I probably wouldn't even be standing up on the board that day -- but hey, I was gonna get in what I could. To my amazement, Ryan had me up on a board and riding within the hour. I was ecstatic since I wasn't even expecting to get up on the board at all. At the end of the set, he was sure to push me to get a good one in so I could end it on a smile instead of a fall. Killer lesson, had a blast and I'm hooked now. Really wish I could've made it back for more that week. Anyway -- super personable and nice guy. Thanks Ryan! I'll definitely swing in again the next time I'm through there. What a great experience for my daughter. Ryan is a perfect instructor. High energy lesson and he knows how to work with teens. Recommended highly!! February 2017 What a great experience for my daughter. Ryan is a perfect instructor. High energy lesson and he knows how to work with teens. Recommended highly!! Ryan was the absolute best. Spent Thurs-Sun surfing with him every day. His instruction brought my surf skill to a new level. He was attentive, encouraging and enthusiastic. Not only did we surf the whole weekend, but he spent time showing me around the city, all the best places to go! Just a 5 star experience on all levels, don't waste time looking anywhere else for a surf lesson! February 2017 Ryan was the absolute best. Spent Thurs-Sun surfing with him every day. His instruction brought my surf skill to a new level. He was attentive, encouraging and enthusiastic. Not only did we surf the whole weekend, but he spent time showing me around the city, all the best places to go! Just a 5 star experience on all levels, don't waste time looking anywhere else for a surf lesson! Had an amazing day with my sister, and Ryan. Hes absolutly amazing. Anyone who wants to learn to surf should really come by and see him. Hes friendly and just an awesome teacher. Thanks dude, for such a steller time. January 2017 Had an amazing day with my sister, and Ryan. Hes absolutly amazing. Anyone who wants to learn to surf should really come by and see him. Hes friendly and just an awesome teacher. Thanks dude, for such a steller time. This guy Ryan and I met on the beach and no crazy waivers fees or nothing, great price for three hours with a board, and he ended up letting me keep if for another hour if I wanted! Then he stepped out, and shot me a text saying, keep it for another hour! Ended up getting a killer shred when the lifeguards said I needed a board, and good ol' Ryan Ragan came through. Mad respect. January 2017 This guy Ryan and I met on the beach and no crazy waivers fees or nothing, great price for three hours with a board, and he ended up letting me keep if for another hour if I wanted! Then he stepped out, and shot me a text saying, keep it for another hour! Ended up getting a killer shred when the lifeguards said I needed a board, and good ol' Ryan Ragan came through. Mad respect. Ryan is a wicked chill dude and is very knowledgeable when it comes to surfing. Great motivator, great person, and great store; I would highly recommend anyone learning to surf in Daytona to go learn from Ryan. January 2017 Ryan is a wicked chill dude and is very knowledgeable when it comes to surfing. Great motivator, great person, and great store; I would highly recommend anyone learning to surf in Daytona to go learn from Ryan. Best experience ever. I Traveled from TN & came across Vast Oceans Surf & SUP, while exploring the Daytona Beach area. Taking my first surfing lesson with Ryan Ragan was the best decision. I highly recommend him to anyone wanting to learn or wanting to have an unforgettable experience on a surf board. He is very knowledgeable and professional with expert skills & technique to match. Anyone will be ready to catch a wave after just one lesson with Ryan. I give Vast Oceans Surf and SUP 6 stars on a 5 star scale! January 2017 Best experience ever. I Traveled from TN & came across Vast Oceans Surf & SUP, while exploring the Daytona Beach area. Taking my first surfing lesson with Ryan Ragan was the best decision. I highly recommend him to anyone wanting to learn or wanting to have an unforgettable experience on a surf board. He is very knowledgeable and professional with expert skills & technique to match. Anyone will be ready to catch a wave after just one lesson with Ryan. I give Vast Oceans Surf and SUP 6 stars on a 5 star scale! My wife and I took a couples surfing lesson, and he had us standing up and dropping in within the first hour. If you want to learn to surf, go see Ryan--he's the man. January 2017 My wife and I took a couples surfing lesson, and he had us standing up and dropping in within the first hour. If you want to learn to surf, go see Ryan--he's the man. Ryan was such an awesome instructor. He has vast knowledge and experience in surfing, and he was so encouraging to my husband and I as we learned to surf for the first time. We both got up a bunch of times in the waves during our first hour of surfing! If you don't have a bunch of time but want a quality lesson, you've got to book here!! January 2017 Ryan was such an awesome instructor. He has vast knowledge and experience in surfing, and he was so encouraging to my husband and I as we learned to surf for the first time. We both got up a bunch of times in the waves during our first hour of surfing! If you don't have a bunch of time but want a quality lesson, you've got to book here!! Ryan was so amazing and great at what he does . He is a very knowledgeable surf instructor. He was very patient and passionate surf instructor. If we lived closer we would take weekly lessons . Very happy with our surf lesson and Aaron was beaming after he rode a bunch of waves . January 2017 Ryan was so amazing and great at what he does . He is a very knowledgeable surf instructor. He was very patient and passionate surf instructor. If we lived closer we would take weekly lessons . Very happy with our surf lesson and Aaron was beaming after he rode a bunch of waves . Was so much fun! Ryan was kind & is an awesome human! The boards were great. We thoroughly enjoyed ourselves. Thanks for a fun time! God bless! December 2016 Was so much fun! Ryan was kind & is an awesome human! The boards were great. We thoroughly enjoyed ourselves. Thanks for a fun time! God bless! We arrived at the shop in the late afternoon and our daughter wanted to surf. We called the number on the door and the owner came in from his day off. He gave us a great price and set her up with a wet suit. He shared some great experiences with our children. It was a highlight of her trip! We would definitely recommend this shop. What an amazing experience, and a genuinely nice person! December 2016 We arrived at the shop in the late afternoon and our daughter wanted to surf. We called the number on the door and the owner came in from his day off. He gave us a great price and set her up with a wet suit. He shared some great experiences with our children. It was a highlight of her trip! We would definitely recommend this shop. What an amazing experience, and a genuinely nice person! Highly recommend Ryan and his surf school. My son had a blast. Ryan is great with all ages and the whole class had a blast. We will be sure to come back every year. November 2016 Highly recommend Ryan and his surf school. My son had a blast. Ryan is great with all ages and the whole class had a blast. We will be sure to come back every year. Had a surf lesson with Ryan. Had the best day got standing up on first attempt. Great instruction on the beach for safety and how to get surfing. If you want to learn to surf this is the place to go at Daytona Beach florida. November 2016 Had a surf lesson with Ryan. Had the best day got standing up on first attempt. Great instruction on the beach for safety and how to get surfing. If you want to learn to surf this is the place to go at Daytona Beach florida. Best place to learn to surf by far. Ryan covers everything, from proper techniques, safety issues, favorable conditions, you name it. Really made me feel excited about trying something I've always wanted to learn, and encouraged me throughout the entire process. He's passionate about what he does and instills that in his students. Great value also for the knowledge you gain. I'm definitely going back... next week. November 2016 Best place to learn to surf by far. Ryan covers everything, from proper techniques, safety issues, favorable conditions, you name it. Really made me feel excited about trying something I've always wanted to learn, and encouraged me throughout the entire process. He's passionate about what he does and instills that in his students. Great value also for the knowledge you gain. I'm definitely going back... next week. Excellent surf shop with great service and knowledgeable lessons. Instructor was patient and helpful!! Love it and will be back when we come to the area again!! Thank you! September 2016 Excellent surf shop with great service and knowledgeable lessons. Instructor was patient and helpful!! Love it and will be back when we come to the area again!! Thank you! Such a great experience. Ryan had us all standing up on the first lesson. He's high energy, positive, encouraging. The equipment is top notch. I'm 49 years old, and was afraid that I'd feel uncomfortable because of my age. Not at all! Group lesson had ages from 13 to 49, and he was able to make it work for all of us. I highly recommend Vast Oceans. September 2016 Such a great experience. Ryan had us all standing up on the first lesson. He's high energy, positive, encouraging. The equipment is top notch. I'm 49 years old, and was afraid that I'd feel uncomfortable because of my age. Not at all! Group lesson had ages from 13 to 49, and he was able to make it work for all of us. I highly recommend Vast Oceans. It was amazing. Me and my buddy Daniel were looking to have a great surf day and he gave it to us. We came here September 4th and this will be a day him and I won't forget. We're apart of the team now? My sister, daughter, and I had a fantastic surf lesson with Ryan Ragan today in Daytona Beach! Ryan is so passionate about teaching and his enthusiasm is contagious! The lesson was great fun while still focused on safety. I recently tried surfing on my own for the first time without a lesson and after today realize that was a mistake. Rather than beating myself up today I was able to ride waves and enjoy it! Thanks Ryan for a wonderful experience! September 2016 My sister, daughter, and I had a fantastic surf lesson with Ryan Ragan today in Daytona Beach! Ryan is so passionate about teaching and his enthusiasm is contagious! The lesson was great fun while still focused on safety. I recently tried surfing on my own for the first time without a lesson and after today realize that was a mistake. Rather than beating myself up today I was able to ride waves and enjoy it! Thanks Ryan for a wonderful experience! The owner and instructor Ryan Ragan's surf knowledge, skill, and enthusiasm is off the chain. He is patient and helpful to address individual concerns. I rate his surf school a big 6 out of 5 stars! August 2016 The owner and instructor Ryan Ragan's surf knowledge, skill, and enthusiasm is off the chain. He is patient and helpful to address individual concerns. I rate his surf school a big 6 out of 5 stars! If you want to learn to surf,this is the place. I am 55 years old and have always wanted to surf. Pro surfer Ryan Ragan was our instructor. He teaches technique and safety on the beach first. When he sees that your ready,he takes you out to the waves. I got up on my first try. Ryan is a great guy and can teach people of any age to surf. Check it out you'll be glad you did. August 2016 If you want to learn to surf,this is the place. I am 55 years old and have always wanted to surf. Pro surfer Ryan Ragan was our instructor. He teaches technique and safety on the beach first. When he sees that your ready,he takes you out to the waves. I got up on my first try. Ryan is a great guy and can teach people of any age to surf. Check it out you'll be glad you did. I want to give Ryan Ragan a SIX!!! Ok I'm ...well let's say, a senior chick with too many pounds on me, yet with his patient instruction and awesome equipment, I actually got UP on my first lesson OMG! I'm def going back to HIM for more lessons! Who wants to join me? Thanks Ryan - you ROCK! August 2016 I want to give Ryan Ragan a SIX!!! Ok I'm ...well let's say, a senior chick with too many pounds on me, yet with his patient instruction and awesome equipment, I actually got UP on my first lesson OMG! I'm def going back to HIM for more lessons! Who wants to join me? Thanks Ryan - you ROCK! Ryan is awesome! Best choice I could've done for my first time surfing experience. Not your typical huge shop trying to sell something. He is a really good instructor (has lots of patience and explain you step by step) and really good person! Ryan was very accommodating and knowledgeable, our entire family had a wonderful experience. Would definitely recommend! June 2016 Ryan was very accommodating and knowledgeable, our entire family had a wonderful experience. Would definitely recommend! Ryan Ragan is awesome!!! such a cool guy,, really helped me out with a bike rental! I'm from Australia and he was super keen to help me learn about the area! Life changing. Surfing is something I've dreamed about doing for years. I truly didn't expect to be able to stand up the first time or even be decent at it, but with Ryan's help I exceeded my expectations. 5 stars not just for an amazing experience, but for inspiring confidence in myself and helping me fulfill a dream. June 2016 Life changing. Surfing is something I've dreamed about doing for years. I truly didn't expect to be able to stand up the first time or even be decent at it, but with Ryan's help I exceeded my expectations. 5 stars not just for an amazing experience, but for inspiring confidence in myself and helping me fulfill a dream. An EPIC experience. Although learning to Surf was on the Bucket List, never really thought it would happen. Ryan GUARANTEED he could get me up on a board despite my 52 yrs and almost as many extra pounds. Very positive coaching, motivation and in-water instruction got this old fatty up and surfing DUDE! Thanks Ryan, CHEERS! June 2016 An EPIC experience. Although learning to Surf was on the Bucket List, never really thought it would happen. Ryan GUARANTEED he could get me up on a board despite my 52 yrs and almost as many extra pounds. Very positive coaching, motivation and in-water instruction got this old fatty up and surfing DUDE! Thanks Ryan, CHEERS! I signed up for surf lessons as a birthday present for my 12 year old son and I to take together. Neither of us had ever surfed. We had a wonderful time. Both my son and I were able to surf after one lesson with Ryan! We highly recommend Ryan for lessons!! June 2016 I signed up for surf lessons as a birthday present for my 12 year old son and I to take together. Neither of us had ever surfed. We had a wonderful time. Both my son and I were able to surf after one lesson with Ryan! We highly recommend Ryan for lessons!! This guy is good, he got me up on my first wave ever. June 2016 This guy is good, he got me up on my first wave ever. An unassuming storefront on International Blvd., right at the entrance to the beach. Ryan is an awesome instructor getting both our kids up on the board right away! My wife did great, it took me a little longer, but Ryan was both patient and encouraging. Josh and Wyatt were great help too! We highly recommend Vast Oceans and their world class service! June 2016 An unassuming storefront on International Blvd., right at the entrance to the beach. Ryan is an awesome instructor getting both our kids up on the board right away! My wife did great, it took me a little longer, but Ryan was both patient and encouraging. Josh and Wyatt were great help too! We highly recommend Vast Oceans and their world class service! Ryan was an awesome surfing instructor. I can't wait to go back and rent a board from him! May 2016 Ryan was an awesome surfing instructor. I can't wait to go back and rent a board from him! I took two lessons last year at another surf school in Daytona and was not able to get up and ride a wave. Ryan got my friend and I in the water and we both stood up and rode out waves on our first try!! Ryan was very informative and placed us on the best boards to learn on, can't wait to take another lesson! If you live in the Daytona Beach area or are here on vacation and want to try surfing, Vast Oceans is the place to go! May 2016 I took two lessons last year at another surf school in Daytona and was not able to get up and ride a wave. Ryan got my friend and I in the water and we both stood up and rode out waves on our first try!! Ryan was very informative and placed us on the best boards to learn on, can't wait to take another lesson! If you live in the Daytona Beach area or are here on vacation and want to try surfing, Vast Oceans is the place to go! Ryan is an excellent instructor, and very patient. I was surfing on my first attempt, and now I am hooked and buying a board! He is truly passionate about what he does and it showed from start to finish. May 2016 Ryan is an excellent instructor, and very patient. I was surfing on my first attempt, and now I am hooked and buying a board! He is truly passionate about what he does and it showed from start to finish. Such a great experience! Ryan was very helpful with our group. He gave a quick lesson before to ease our nervousness because it was our first time. He helped the entire group enter the water safely. Great lesson and super friendly staff. Easy for beginners. Up close experience with dolphins in their natural habitat. May 2016 Great lesson and super friendly staff. Easy for beginners. Up close experience with dolphins in their natural habitat. The people are really nice, had such a fun time paddle boarding. I would recommend to anyone! May 2016 The people are really nice, had such a fun time paddle boarding. I would recommend to anyone! My kids and several of their friends and I took a lesson in early April. The instructor was great with the kids. His class was great; everyone learned to surf. May 2016 My kids and several of their friends and I took a lesson in early April. The instructor was great with the kids. His class was great; everyone learned to surf. Ryan is an incredible instructor. His high energy and encouraging approach made it easy to learn and love surfing! I couldn't believe I was actually able to surf after just one lesson, and he makes you look good doing it! He is also one of nicest people in Daytona. I highly recommend taking lessons from Ryan. He can make anyone able to surf with style. April 2016 Ryan is an incredible instructor. His high energy and encouraging approach made it easy to learn and love surfing! I couldn't believe I was actually able to surf after just one lesson, and he makes you look good doing it! He is also one of nicest people in Daytona. I highly recommend taking lessons from Ryan. He can make anyone able to surf with style. Ryan just gave my 9 year old son, his first surf lesson and he was awesome! He is an amazing teacher and my son is so excited to be surfing! I would highly recommend him, for children and adults! We will be going back for the summer camp! April 2016 Ryan just gave my 9 year old son, his first surf lesson and he was awesome! He is an amazing teacher and my son is so excited to be surfing! I would highly recommend him, for children and adults! We will be going back for the summer camp! Ryan is an outstanding surf instructor. I never thought it would be something I could do, and he created a surfing addict after one lesson. He made me confident in the water and can do the same for you. I highly recommend Ryan. If you are in Daytona this is a must! April 2016 Ryan is an outstanding surf instructor. I never thought it would be something I could do, and he created a surfing addict after one lesson. He made me confident in the water and can do the same for you. I highly recommend Ryan. If you are in Daytona this is a must! Ryan was one of the best instructors I have ever had. In a matter of minutes he had me surfing like a pro! I have a bunch of friends that surf and after one lesson from Ryan I can keep up with them. I was fortunate enough to learn on the best day of waves in months! 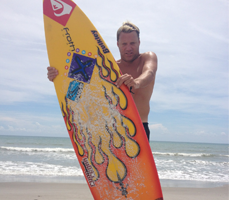 Bryan is a very professional instructor who makes surfing an experience of a lifetime. I would definitely go back there and do business with Vast Oceans Surf Shop! April 2016 Ryan was one of the best instructors I have ever had. In a matter of minutes he had me surfing like a pro! I have a bunch of friends that surf and after one lesson from Ryan I can keep up with them. I was fortunate enough to learn on the best day of waves in months! Bryan is a very professional instructor who makes surfing an experience of a lifetime. I would definitely go back there and do business with Vast Oceans Surf Shop! I took surf lessons from Ryan and he was amazing, taught me a lot for my first lesson. April 2016 I took surf lessons from Ryan and he was amazing, taught me a lot for my first lesson. Today my 5 year old had a great lesson w/ Ryan. Ryan was a great teacher and made it super fun for him. Ryan was right there with him the whole time and I am so glad we went with vast oceans! Thanks, Ryan! March 2016 Today my 5 year old had a great lesson w/ Ryan. Ryan was a great teacher and made it super fun for him. Ryan was right there with him the whole time and I am so glad we went with vast oceans! Thanks, Ryan! The Instructor was great! He knew what he was doing. He knew how to instruct and I actually got up this time because of him. March 2016 The Instructor was great! He knew what he was doing. He knew how to instruct and I actually got up this time because of him. Ryan was a great instructor! My 14 year old and I had a great time. Ryan was great encouraging us even with a strong current. And it was great having the surf shop right by the beach! March 2016 Ryan was a great instructor! My 14 year old and I had a great time. Ryan was great encouraging us even with a strong current. And it was great having the surf shop right by the beach! While I can't speak of any lessons in the water, as a person whose life was touched by Ryan Ragan following a bad during accident, I'll speak volumes of Ryan's character and lessons he offers on living life as a decent man of character . In 2005, I broke my back surfing. As a parent of two young girls and husband and pretty athletic person, I was devastated by the potential of facing possible paralysis and a loss of an active lifestyle. Drowning in self pity and hopelessness, I was sinking into massive depression. Out of the blue I received a phone call from a young professional surfer named Ryan, who had also faced similar circumstances after a near career ending accident of similar proportions. Ryan gave me hope and really lifted my spirits during that dark time, bringing hope and support to a complete stranger. I'm up on my board again, I've run a marathon, climbed mountains and dove in many places in the world's beautiful oceans. Each day I say a prayer of thanksgiving for physical recovery and for a most kind soul who reached out and helped pull me from that sea of uncertainty in which I felt like I was drowning. You and your kids will certainly learn how to surf in his surf camp, but more importantly, we can all learn much from this man's examples of kindness and the lessons he brings in being a good-looking decent human being. I'm most grateful for Ryan Ragan, and happy to see his dreams of teaching people to surf coming to fruition. More importantly, I'm grateful to now call this man a friend. I had a great surfing lesson with Ryan at Vast Oceans. Ryan offered great instruction and encouragement in a positive, effective and incredibly enthusiastic way. I look forward to returning with my family for more lessons. May 2016 I had a great surfing lesson with Ryan at Vast Oceans. Ryan offered great instruction and encouragement in a positive, effective and incredibly enthusiastic way. I look forward to returning with my family for more lessons.